Available in white or chrome, not only is it attractive but this energy saving kettle will use on average around 31% less energy than a traditional kettle. It works allowing you to easily boil only the amount of water you need. It has a 1.5 litre capacity and you simply fill the main chamber then use the plunger to load the required amount of water into the boiling chamber. 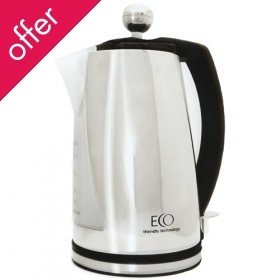 This kettle comes recommended by the Energy Saving Trust. At just £35 it compares quite favourably in price with similar but less efficient models and based on 2000 boils a year it will save you around £12 a year, so keep if for 3 years and you basically get it free! 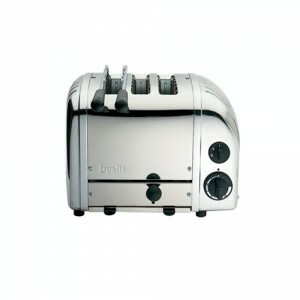 This stylish chrome combination toaster and sandwich toaster not only looks the part but is a real quality piece of kit. At £195, it’s certainly not the cheapest toaster on the market but it is built to outlast its rivals. Remember also of course that it is two appliances in one. It has a sandwich cage and two toasting slots. As well as being two products in one, each slot can be individually controlled so you can save energy, and money, every time you use it. In addition this product comes with a free recipe book. Slow cookers have lots of advantages. They fit in well with modern, busy lifestyles as they can be turned on the morning and left while you’re out at work so that your evening meal can be ready when you arrive home. The meals they make tend to be more flavoursome as they are marinated for longer and you can get away with using cheaper cuts of much which will still be deliciously tender. In addition though, they are much cheaper to run, and more environmentally friendly, than a conventional oven. This model is even better than average, as it uses 44% less energy than a standard model. It has three settings. Medium is the standard and equates to 5.5 to 7.5 hours cooking time. There is a low option for when you really want all of the flavours to infuse or a high option for when you need to cook a meal a little more quickly. 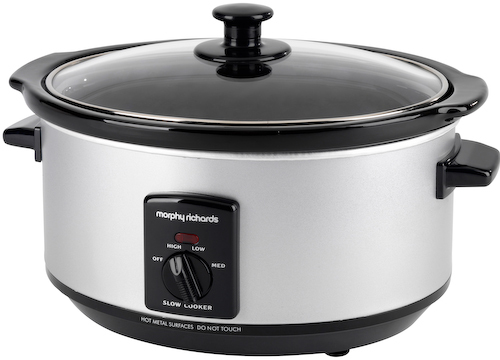 It has a 2.5 litre usable cooking capacity. You buy the Morphy Richards Slow Cooker for just £29.92. Bargain!